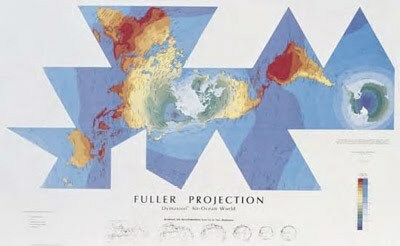 “Fuller´s Dymaxion Airocean World Map of 1943 cuts the earth into triangular facets that are then unfold as a flat polyhedron. Both the north and south poles are presented frontally and equally, with little distortion, although the typical viewer is at first likely to be disoriented by this unusual, poly-directional arrangement of countries. Only the graphic graticule of latitude and longitude allows the reader to comprehend the relative orientation of any one location. Interestingly, the Dymaxion structure can be unfolded and re-oriented in any number of different ways, depending on the thematics of one´s point of view. The polyhedral geometry provides a remarkably flexible and adaptive system wherein different locations and regions can be placed into significantly different sets of relationship. Precisely where the map is cut and folded determines how the parts are seen in relationship to each other, each time in radically altered, yet equally true, configurations. Potentially at least, each arrangement possesses great efficacy with regard to certain socio-political, strategic and imaginative possibilities”. James Corner, The Agency of Mapping. _ “there is no one narrative of a city, but many narratives construct cities in different ways highlighting some aspects and not others” (Bridge/Watson 2000). How we imagine the city will thus depend to a large extent on what our interest in the city is and what we want to know about it (King 2007). _ the city as a collection of stories. _ The map, and also the aerial photography, gives a description of the world as seen from above, and thus offers important knowledge about the dimensions, build-up and relationship between the city’s physical elements, such as streets, squares, parks, buildings etc. However, it does not capture the atmosphere of a place, and does not record the numerous stories which lie within the physical, tangible reality it describes. _ Dérives involve playful-constructive behaviour and awareness of psychogeographical effects, and are thus quite different from the classic notions of journey or stroll.” (Debord 1958). Through recording his aimless, dream-like walking through the streets of Paris, Debord made a series of “psycho-geographical” maps reflecting subjective perceptions of the everyday condition of the urban fabric. The resulting map was hence a cognitive one, rather than a mimetic description of the city (Corner 1999). The situationists, through this preference for a cognitive approach rather than a positivistic one, were making an attempt to return the map to the everyday (Corner 1996).